This week's Health & Wellness guest is Heidi Bodak. I've known Heidi for quite some time. We met at a gym called Club Julian (boy do I miss that place!) and, soon after, realized that we lived in the same neighborhood. Since that time, Heidi and I have both relocated and our lives have changed with the birth of babies and all the busyness that parenthood entails. But Heidi's passion for fitness remains. She's working hard to keep herself in great physical condition with optimal health, and she now has a mission to help others do the same. I live in Pittsburgh, PA. I have lived here most of life, but I did spend a year living in Florida recently ... and I’m so happy to be home! I am a mom of 3 children. I have a 12-year-old son named Will, an 8-year-old daughter named Sophia, and a 6-year-old son named Giovanni. They challenge me and make me laugh every single day! I also have a dog (Mastiff) named Lilo. I am 36 years old, and I am primarily a Beachbody coach focusing on preventative health. My background is in general office work, but health and fitness has really become my passion! I have been a yo-yo dieter my whole life. I never really understood why people ate organic or "clean." I enjoyed food way too much to really care! Fast forward to two years ago when my mom was diagnosed with an aggressive form of breast cancer. I went to her doctor appointments with her, and they didn’t have an explanation of where the cancer came from. We have no history of any kind of cancer in our family. It was a wake up call for me because her cancer was most likely caused from the environment and her diet. I have really started researching and trying to educate myself and others in health and fitness, taking the approach of "let’s get healthy” instead of treating sickness. That’s where Kim’s book has been eye-opening and so educational! Recently, we have been blessed to be a part of a club called TRWMG Bridges Kids. It’s a fantastic organization helping our Military. We have done things like make care packages for our men and woman overseas. It’s so nice to have the kids involved, and they are learning to give back. My biggest inspiration is my sister Heather. Heather has experienced the loss of a child due to terminal illness. Although it’s taken her a long time to find some sort of happiness, her strength to go on everyday and to begin to talk about him and share that with others is truly inspiring. It has taught me to be grateful for what you have, not what you want. I enjoy going to sports games, and I love to go dancing. My two guilty pleasures would definitely be a good cocktail and a homemade cookie! I would definitely say to start small. You can’t make a huge change overnight. It will never stick. 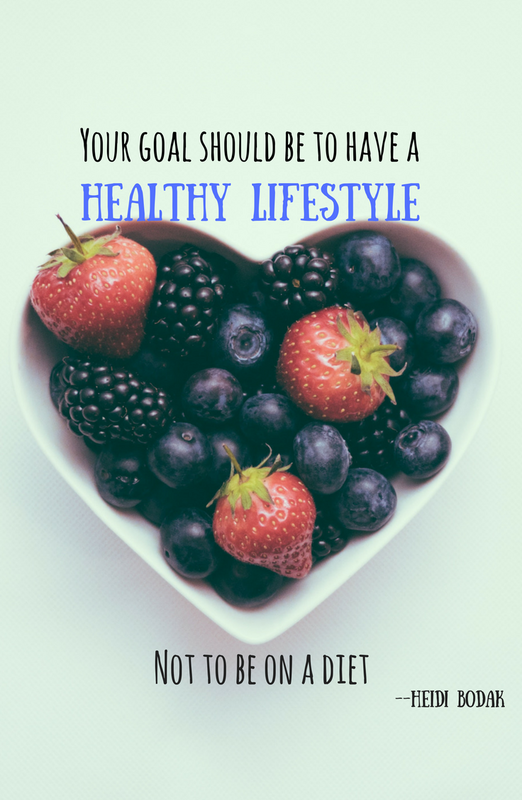 Your goal should to be to have a healthy lifestyle not to be on a diet. Take time to do some personal development. The book “The Spark and the Grind” by Erik Wahl is a great one to help you set goals for yourself. Find a workout regimen that works for you NOT someone else. Make sure it’s at your personal level, and you will feel successful and stronger. I personally run support and accountability groups on Facebook to help keep you on track. Make time for self-care … even if you can’t afford a massage, get yourself some lavender epsom salt, and soak in the tub. I hope you've enjoyed reading this interview with Heidi. She's such a beautiful person inside and out, and I'm honored to call her my friend. If you're looking for a Beachbody coach or just someone to look to for inspiration, you should definitely follow her on social media. I personally have enjoyed doing some Beachbody workouts at home. They're perfect for busy moms or for anyone who has a limited amount of time to exercise. Plus, you can do them at home!